"Portugal 1934". Lisbon, Edited by S.P.N. (Secretariado Nacional de Propaganda), 1934, in-folio max., 40 pp., 44.5x32cm. 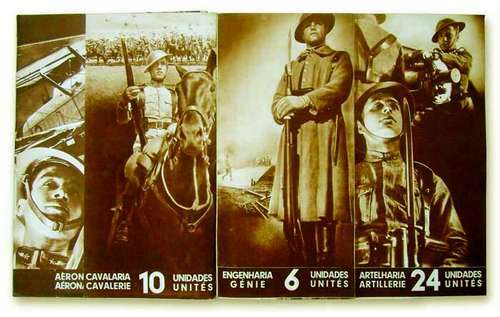 Official propaganda book for the Estado Novo, the regime inaugurated by Salazar in 1933. Black cover. Fully illustrated with almost 200 photographs. This large format edition was published with three different covers (orange, green and black). The book includes several half-size pages, full double-pages bleeds and fold-outs. Photographs by the most famous photographers of the time: AlvÒo, A. Rasteiro, JoÒo Martins, Diniz Salgado, Ferreira da Cunha, Francisco Santos, Horßcio Novais, J. Benoliel, José Mesquita, Luis Teixeira; Pinheiro Correia, Mßrio de Novais, Octßvio Bobone, Raimundo Vaissier, Ra·l Reis, Salazar Diniz, Serra Ribeiro, V. Rodrigues.